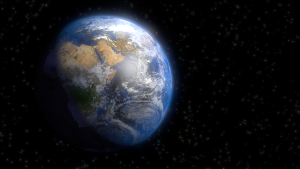 Home » Science » Why is the Earth round? In a Nutshell : The Earth is round because gravity pulls with equal strength in all directions, so that any uneven bits are pulled back in line with all the other bits, making a sphere. Imagine a crowd of people standing in a field, each person is tied to the others. Now imagine they all start pulling on the ropes that bind them together. The crowd of people will quickly be pulled into a circle, and anyone who tries to move out of the circle will be pulled back in. This, in three dimensions, is what happens to the Earth – it’s called hydrostatic equilibrium. This is what tries to happen with any and all mass, it’s just that gravity is a very weak force. Your mobile phone, for instance, exerts gravity on itself and everything around it, but its gravitational pull is so incredibly tiny that you can’t feel it and it cannot possibly overcome the strength of the metal and plastic that gives the phone its rectangular shape. But the larger an object gets, the stronger its gravity. Any asteroid bigger than about 1,000 km (621.37 miles) across will collapse into a sphere under its own gravity. This is now one of the definitions of a planet, according to the International Astronomical Union. In fact, the Earth is not completely round. Once every 24 hours it spins round an axis that runs through the poles, and this means that the equator is moving much faster than the poles. With the surface of the Earth at the equator moving at 1,675 kph (1,040 mph), there is a centrifugal force pressing out, and this makes the Earth bulge at the equator. The distance from the centre of the Earth to the equator is about 0.33% further than the distance from the centre of the Earth to the poles, which means that the diameter of the Earth from pole to pole is 43 km (26.72 miles) less than across the equator. So the top of Mount Everest is not the point on the Earth’s surface furthest from the centre of the planet – that’s actually Mount Chimborazo in Ecuador, which is almost on the equator. Being thicker in the middle means the Earth is not a sphere, but an oblate spheroid. Being thicker in the middle means the Earth is not a sphere, but an oblate spheroid. As well as this bulge around the middle, the Earth also has mountains, valleys, ocean trenches and other wrinkles, so its surface is not smooth. But compared to the overall size of the Earth these wrinkles are tiny. A billiard ball is smooth to within a tolerance of 0.22%, but the Earth is smooth to within a tolerance of 0.17 per cent, so if a galactic-size giant came along and handled the Earth it would feel smoother than a billiard ball.